Good to see all the regeneration going on in Liverpool. However isn't it time something was done with London Road? The magifence of St George's Hall is overshadowed by this tatty dump. I know it has improved slightly but it still needs more and nothing ever gets done. The only thing that has improved there is Pembroke Place. The road and most of the neighbouring streets are an absolute mess. Islington and New Islington should also be planted up. That road is also scruffy and is also the major way into the city from the East too. Surely a few trees wouldn't go a miss? Corner of London Road and Anson Street(?) last weekend. London Road and Moss Street last weekend. Yeh there is an improvement at the top end but the bottom end by the Odeon is a disgrace. Thanks for the snaps Dave, that pub has been derelict for years! Glad to see some stuff going on. They'd be lovely done up I wish the council would get a move on. But it's the same story on Lime Street. The Astoria Cinemar and all that row is a bit tatty too. Especially now that the old Astoria has ads all over it. Another slighty grotty area (just off London Road actually) is Seymour Street. Alright, they have renovated the Georgian terrace but the land opposite is crying out for development. Especially now that St Vincent's Way is now disused so to speak. 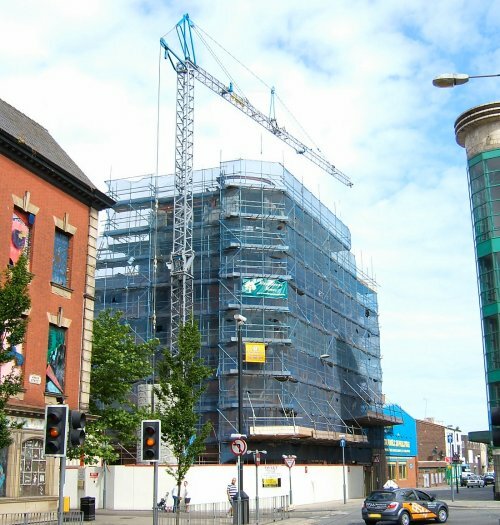 Why won't the Liverpool Land Company do more to get sites like these built upon? This is a prime city centre location which is being left to become overgrown. 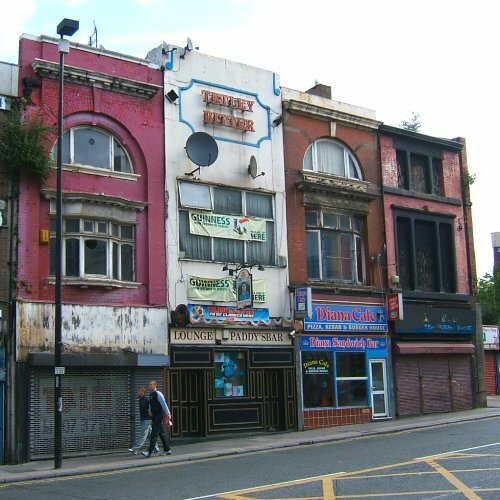 Infact most of London Road is being left to rot away which is bad because the location is just fantastic! Lime Street itself could be better too. The stretch between the empty ABC cinema and the Adelphi is appalling. I never go down there very often because it is a nothing area with no attraction, in fact it hasn't declined it has always been like that. Why doesn't the council do something about it. Typical! Why does the council have to block, good, sound plans. Footballers can raise the profile of any grotty area. Surely a development such as that would have kicksarted the regeneration of the Lime Street area! i dont think land should neccessarily be built on just for the sake of it.Thats been happening for too long now everywhere!.There is too much pressure being put on developers i feel,to just build build build on any spare land people dont like the look of. I would like to see some of these areas (grot spots)& we all have them,put to other use such as community allotments,or even just grassed over,if only to improve the appearance of the area.The local authority should force the owners of the land to maintain it,or face financial penalties. I don't know if its being done already but someone from the City Council needs to go around identifying land that is looking drab & identifying who owns the land in readiness for 2008. Lets concentrate on bringing some of the existing buildings back into use first,before building elsewhere just for the sake of it. 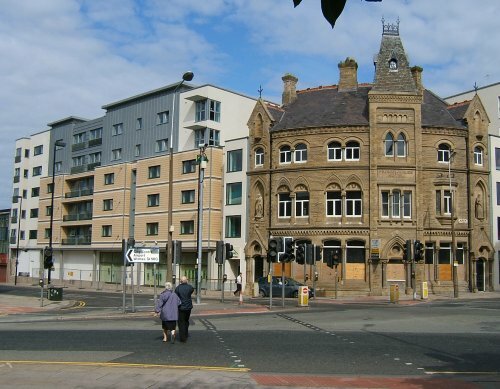 I do agree with you but In the case of Seymour street/London Road Corner something of Geogian style should be built to make the area look nicer. It is now the main route to get to the station and so the area is now becomming a one of the main places to be. Surely something which is very low key could be constructed? Renovation wise, well St Mary's Road in Garston would be a good place to start. This once grand throughfare has just deteriorated and deteriorated over the years. Walton has come up again thankfully! And Kensington is starting to now aswell. On the whole, I think that the City still has a long way to go before things are looking as they should do. Nevertheless, things are being done. Paradise Street is taking shape and the Lime Street Gateway will hopefully commence soon. Just quickly, the Lime Street Gateway is something of interest. They are doing some great things outside of the station, but what about the view when you come out of the station. The St Johns Car Park is the real grot spot on Lime Street! Why cant a mock facade be built around the car park to mask it's uglyness? PS. I meant Futurist Cinemar and not the Astoria! alpologies for any confusion! know what it originally was? I think that used to be the Co-op. All the upper floors were converted into student accommodation, but the ground floor remains unused. few art-deco buildings in Liverpool. Last edited by PhilipG; 10-31-2006 at 07:27 AM. Is T.J Hughes an art deco building? The Royal Court, The Philharmonic and The original Liverpool airport building amongst others though are architectural beasts (meant in a good way) There are many more like the Mersey tunnel entrance and ventilation shaft buildings, India Buildings and Martins Bank in Water st. Very stand outish of their time so easily recognisable as is the old Littlewoods building of course. All the 1930s tenement blocks were built in this style in this period too. In the past week or so hoardings have been put around The Falkland pub (and the couple of buildings next to it). Also that building with all the different artworks in the windows...Anson Street. I don't know if they're getting demolished or refurbished. Don't recall Bobby's Tricia, but that Burtons was where I got my first Made to Measure Crombie coat from. Had to pay back half my pocket money for months to my mum to pay for it. This was when they were still tailors. God I feel so old! I can't recall that shoeshop Tricia, although if I saw a photo it may jog my memory. 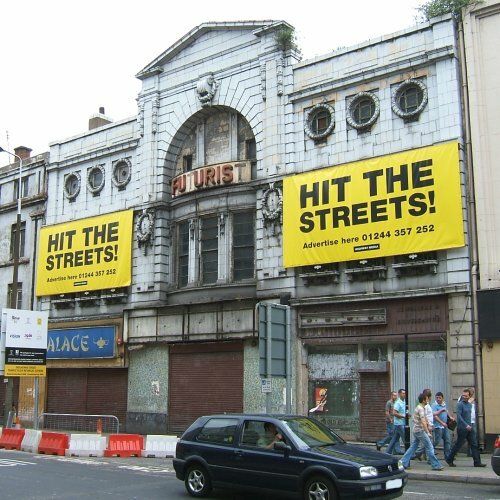 I remember Burtons. Wasn't there another tailors called 'Jacksons' or 'Brass & Jackson ?' - it was on London rd and I think there may have been another branch on Church st.
Is anyone as ancient as me and can remember 'Nanette's' on London rd ? It was a gown shop - wedding dresses and evening wear. The girl mods used to buy their mod gear from Nanette's or C&A's church st.
Then 1969 saw the arrival of the first 'boutiques' in L'pool. 'Shades' (Church st) and 'Amber' (Parker st). The mods would hang around outside listening to the music from the shops and trying to chat up the girl assistants. .
What was that other shop where the guys used to buy their clothes ? .. was it Harry Fentons? Got me 1st Made to measure suit from Alexander Tailors on London Rd,Brown Herriingbone..Went well with me Boss Yanky Ben Sherman,Well Better than Today's Bennies..Finished it off with me Como's from Dolcis..Cooooooooool !!! The Boss Mens shops were Harold Ian on Lime St..Jonathon Silver London Rd..Tony Harris was OK if you were a Skin..Had some nice Bennies in there..
Used to be Some nice Mens clothes shops at the Back of Jack Sharp's but I cant remember the Name of them..another one at the Bottom of Mount Pleasant where the Wimpy used to be..Be off then lookin' at the girlies tryin t' look cool when yer must have looked a right soft T**** !!!.. ... Posin' in Bucks Place and The Babalou or Beechcomber or Chequers with me Cosack hair spray keepin me Bryan Ferry quiff in place ! !.....Arrrrrrrrrrr..am I sayin' I used hair spray on Here !! !..Happy days Though. Wish i Had hair to keep in place these days ! !..More a cross between Bob Hoskins and Van Morrison these days !! Does anybody remember Peacock, a men's boutique at the corner of Dale Street & Stanley Street? With big wooden shutters with a peacock painted on them.